Black Buck is held sacred by the Bishnoi Samaj in Rajasthan. Bishnois give prime importance to nature and they never cut trees or kill animals. Guru Jamboji in 1485 established the Samaj. Bishnois worship blackbucks as an incarnation of Jamboji and other ancestors. Wisdom of Jhambaji is represented in 29 precepts which are proscriptions stating how people should live, e.g., against using intoxicants or eating meat. The rules include a reverence for all living things that even forbids the breaking of a twig of Khejri tree. Before leaving his physical body, Guru Jamboji had asked his followers to revere Black Buck as His manifestation. The belief continues and killing a Black Buck is a sin. Khejri Tree is the staple food of Black Buck and there are numerous incidents mentioned in the history when men and women of the Bishnoi community laid their lives to save Khejri trees from being cleared. Bishnois share their crops with wild animals and orphaned black buck fawns are brought up by Bishnoi women as their own child. 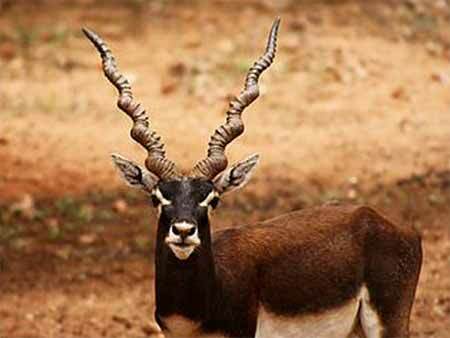 To a Bishnoi, the black-buck, any black-buck, represents one of his ancestors and as such, is an object of veneration. It will be no exaggeration to say that but for the aggressive protection afforded by the Bishnois to this beautiful antelope species, it would have vanished from the desert scene.